"Please Call Me" inventor Nkosana Makate. 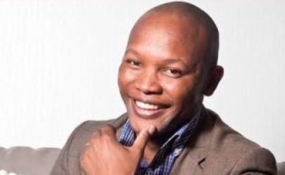 Cape Town — Supporters of Nkosana Makate, inventor of Vodacom's "Please Call Me", have vowed to shut down the service provider's head offices in Midrand on Thursday, 702 reports. According to EWN, Vodacom warned the group to call off its demonstration by midday on Wednesday, but the protesters maintain that Vodacom must pay what Makate is owed for his invention. Calls for action against the telecommunications giant have mounted with Gauteng Education MEC Panyaza Lesufi adding his support. Lesufi tweeted an image of a cease-and-desist letter ordering him to stop commenting on the legal battle between the mobile operator and Makate, adding that he was "not easily intimidated". Makate invented the "Please Call Me" 18 years ago when he worked as a cleaner for Vodacom and proposed the idea as a means for users to contact others without using airtime.